Crouching Tiger, Careless Driving | 2P START! Hope this doesn’t come off as too insensitive, I just love how well the box art image works here. Tiger’s celebration pose so easily becomes an anguish pose when given a different context. Oh, and if you’re totally lost, you need to crawl out from under that rock! Finally, I’d like you all to check out D3vin’s third guest strip he’s done. I must say, his artwork is getting better and better! I was dying to use “Feel the drama” from the back of the real box art, but it drew a little too much attention to itself on our back cover. Without all that fine print it just looked awkward. I think Tim and Ray have a fallback career! Hopefully it doesn’t come to that, but, nice comic, guys. There is something that bothers me for some reason, and maybe I’m the only one that thinks this, but this seems too linked to real life and not enough to video games really, because honestly, the only video game part I see is that the box art of the game is funny, and that kinda seems like a weird joke to make. Yeah, it was okay, I suppose. I think that the text at the bottom was unnecessary. I thought that there was a second punchline and it confused me. I have to agree there. Still, the image juxtaposition was pretty funny. There are more punchlines in the text at the bottom. Coming after tiger with a 9-iron; be a scratch player, watch out for those trees, can play at 2:25 AM. All references to Tiger’s latest episode. i think that back at the US open he got mad he lost so he decided to not show up so he crashed his car! Besides that i really enjoy your comics they are always kid friendly and i love the longer ones because you can re read them more but, when its like the boo costume i only read it 2 times i am sure. But anyways why does tiger look like he broke is back? I mean look at him he is holding his neck! It doesn’t look like one so that is strange very strange. I loved it! Great Comic! Without a doubt the funniest web comic I’ve read in a long time. I didn’t even know about Tiger crashing a car but I still thought the joke was funny. That box art works perfectly. The Wii Wheel logo on the back of the box is a nice touch. Haha, nice. Wasn’t really expecting that, but I’m now glad I know those things about Tiger Woods, just so that I could understand the comic withough having to look it up. Hilarious! All the text at the bottom was also funny in light of his stupidity. I liked the Wii Wheel logo, but I think I’d have to agree that the text at the bottom was unnecessary, because it didn’t add enough to the rest of the comic (or maybe I just didn’t fully get those). Although to be overly nitpicky, most of the damage on the car isn’t in the spot against the tree, so it looks a little awkward. And Tim, that link probably won’t be very helpful if people click it in a couple months (or even weeks). Correction: the stuff at the bottom was just too specific for somebody who only knew basic info about the incident to get. I still think it’s unnecessary, but I guess people who got them right away might think otherwise. Guess it’s time for me to… RISE FROM MY GRAVE (inappropriate capslock ftw!). I’ve been reading the comic since #78, the Fundamental Theorem of War. I have enjoyed all of your comics and have listened to the entire backlog of podcasts (great to listen to while I’m at work). I really liked this comic, especially since I have been getting updates on the whole thing occasionally while listening to the radio. I have to admit though, I wish it had a little something extra… like… oh, I dunno… his wife running out of the crowd toward Tiger angrily swinging one of his drivers. I loved it, but then again, I spent most of Thanksgiving break with ESPN on, so I knew all about the drama of Tiger Woods. The Wii Wheel logo, the text, and the fire hydrant under the car were all nice touches. I really liked it, the whole thing was unexpected. I haven’t seen any other comic, much less a gaming webcomic, approach Tiger Woods yet and it was executed nicely. Good comic, but I have to agree with some of the other commenters on several points. The comic seemed just a bit more connected to the celebrity than the game (though, not knowing about the news, I still found it humorous), the text at the bottom confused me as I was expecting a hidden joke or two there (but I might just be missing something), and the hydrant just looks odd. But that’s all just nitpicking; I still enjoyed the comic overall 🙂 Funny how the same pose can be read completely differently when under different context. Hey, I can see the image now! Thanks for the quick fix. And comparing the comic’s text to that of the real cover, it makes a little more sense now. Kinda funny how a couple of weeks ago I got raked over the coals for not knowing about Mario’s upcoming penguin suit. And now it seems none of these people are aware of a story that’s making national headlines. Apparently all those jokes in the bullet point text at the bottom of the comic are too subtle for the 12-year-olds. Really people, videogame blogs aren’t the only news sources you should read. May I suggest BBC News. And I liked the little extra jokes at the bottom too. OK, here is the problem with the “get out from under a rock” thing. I see a headline about sports and I just don’t care. Many people see the name “Tiger Woods” and they just skip it because they just don’t care about him at all. That’s why I didn’t get it at first. I keep up with current issues. I have educated my self on the swine flu and global climate change. I read about politics and medical advances. I don’t read about Tiger Woods. It’s that simple. That said, I actually like the comic. It is pretty funny once you know a couple of facts. I reread my last post, and I realized that it sounds kind of angry, which is not what I meant. All I am saying is that we all live under a rock, we just choose which one to live under. I chose to live under the rock where I don’t here news about celebrities and sports stars. But you at least had to read the headline which said “Tiger Woods crashes car” to decide that you don’t want to read the article… and that’s all the knowledge the joke requires. Imagine if you are scanning a few dozen headlines, and came across a headline that said “Glutamine antagonist treatment found effective in place of levodopa.” You probably don’t remember reading that, because you probably don’t care about glutamine antagonists or levodopa. You forget about it a half a second after you read it. In fact, you probably never even saw it because you don’t read scientific journals, just like I don’t read the sports section, which is where all the articles on Tiger Woods have been in the local papers I read. Lol, I didn’t realize that you addressed the jokes before you posted. I should read your whole comment. No fightin’ now boys. Take it to Brawl. Fightin’ words indeed, particularly since the comments in the last podcast showed how many people around here are over 18…. I gathered that the bullet-point text included further references to the auto accident, but I guess the jokes there seemed too forced to me. Sorry. Eddie, there’s no need to bring age into this. Underneath the acne and coffee stain moustaches us kids are the same as you. And Great comic guys, I got it. Yeah, sorry, I haven’t been paying attention to the news recently, but if it was THAT big of a deal, I would have heard of it. I’m not that far under the rock. 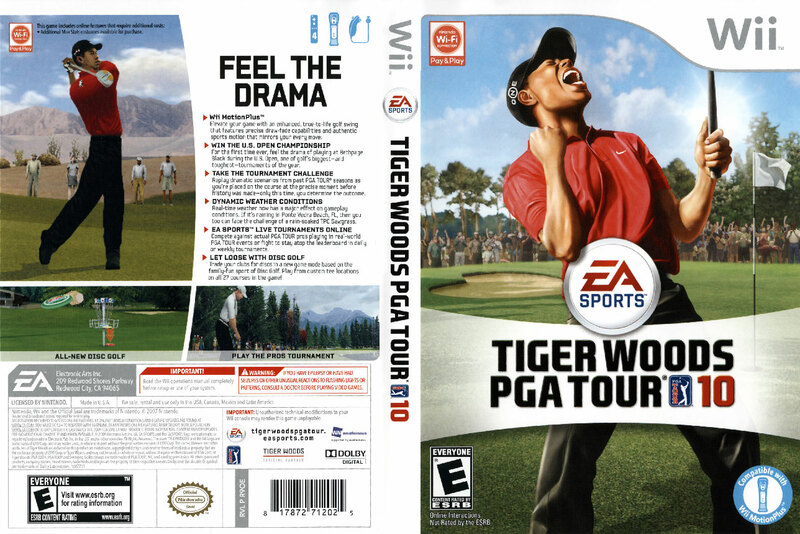 XD I think I vaguely remember something about Tiger Woods, but like Dr. Oswald, I quite frankly, don’t care. I do have to say that before I even got to this page, the title made me chuckle, and the way the box art could be interpreted is kinda funny as well, but the meat of the joke was lost on me. While you’re at it, why not blame 12 year-olds for bad Wii games? Right, but this is a GAMING webcomic. You didn’t know some (rather basic) info about one of the biggest GAMES being released, so you had little right to complain. If we were at “Golfing Webcomic Website”, maybe I would agree with you, but the incident didn’t have a lot to do with games, so people should be forgiven for not knowing the details (i.e. the text at the bottom). I DO agree with FluffyPanda, though, that people at least should have gotten the basic joke, since it was pretty much everywhere. I mean, I don’t give a crap about golf and I heard it…do people go out of their way to avoid news? I don’t agree with DrOswald’s last point, though, because if you ended up seeing a comic a day or two later that talks about glutamine, you’d probably go “Hey, I remember seeing a headline about that” at the very least, so even skimming over the title of “Tiger Woods crashes car” would probably register when you saw the comic. Since this story (for some reason) has been big enough to get mentions on front pages, I would think most people would have heard about it. Maybe it was just me, but with the Cold, Cold Mountain comic, it could kind of be inferred that based on the way the costume looked that it was a new suit for Mario, and so even though I didn’t know anything about NSMBW, I got the comic. It’s a little harder to make an assumption like that with this comic. But I guess I have been living under a rock. Oh well. By that same token, you could probably infer the gist of this comic. Tiger Woods + Car + Tree = Tiger Woods probably hit a tree with his car. But why is that funny? It isn’t unless you know the story. Once you figured out it was a new suit in the previous comic you would realize that Mario killed the mother for the suit, which is the joke. However in this comic, yes, you figured out that he probably hit a tree, but that’s not a joke until you make the relation. I mean yes, I suppose that could be his agony face because he hit a tree, but unless you can connect it to real life, it’s just totally random and doesn’t make sense. It’s not even the kind of random where it’s so random that it’s funny. Well I took the agony face AS the main joke, which figuring out that he hit the tree from context clues is enough to get the joke. But maybe that joke just wasn’t enough for you (and a bunch of other people). Different standards/expectations I guess. Lol, every paragraph in there has a small joke. It’s riddled with little things if you guys look. It’s like the Sonic facebook page. The text at the bottom is just awesome! Yes, you do need to understand a lot of the details of the whole Tiger Woods controversy. Although I enjoyed the last statement, “Never miss you own tournament again, play online!” Just the play on words here is great; Woods missed his own tournament and the box could still be referring to a player missing a in-game tournament. Although I am a bit confused about the first frame. The golf ball is hovering right on the edge, but Woods is considering it a victory. Help me out here, is the ball going to fall in and is this just a quick shot before it goes in? Or is it just right on the edge and not going to fall in? It looks like it will go in, but I’ve seen stranger things happen. Yes, the ball is about to go in. That’s actually the second picture we tried, the first had the ball further away and we feared it would look like he missed. This was as close to the edge as we could find, though a picture with the ball in the hole would have been better. Tim, how come no “driver” jokes? Too obvious? Ha, didn’t even think of it. But did you get my ‘scratch golfer’ joke? Thanks for clearing that up. Strage though, that there wouldn’t be any good pictures of a golf ball in a hole. @ Ray: so it is! Missed that one. There are plenty, but since the hole is quite deep it just looks like… a hole. Not that interesting! BTW, I really dislike the threading on these comments. You can’t see what’s new when returning to the site, most of the time you can’t reply directly to the person you want to (like now) and nobody quotes any more so the RSS feed doesn’t work either. Any chance we could go back to the non-threaded comments? I think you were referencing the scratches Tiger got in the crash, right? FluffyPanda, I was actually just thinking how hard this system makes it to find new comments. The only problem is that going back to unthreaded comments probably won’t be as easy from a technical standpoint as switching to them was. When adding a feature, you only have to make sure it doesn’t screw any of the old method up, but taking away a feature will almost certainly screw it up. And even if the posts are kept, imagine how confusing it would be to find the comments section with all the threaded comments willy-nilly since there’s no quotes to help with context clues. Now I obviously don’t know how exactly things work on the back end, so Tim would be the one who could confirm or deny that. -allow unlimited (or a large number) of replies in a single thread, but put any after a certain number in spoilers by default. That wouldn’t help finding new posts, but it would help with the issue of 3 replies being a little small. I like the way you’ve put the wheel icon on the back cover. Cool comic. Also: Wii Wheel? Meh, decent comic. Didn’t get the “Scratch Golfer” thing. I didn’t hear many details about the crash either, but its not your fault. Wait a minute, it’s really “Pay & Play” for online play? For a GOLF GAME??? Fail! Yeah, got the joke, though no laughs have escaped from my lips. Good job with the back cover thing, though. Nice comic guys, especially that one done by that “D3vin” guy. In all reality, I didn’t see this one coming, and I have been keeping an eye on this possible Tiger Woods scandal. Haha, Great Comic Guys! I heard about Tiger’s car accident a few days ago, so that definitely helped with understanding the joke. I thought the joke was solid enough with just the cover art, but the extra text added really added onto the comic to make it even better. Meph, this storys getting old. Even NPR wouldnt stop talking about it! Then I read that it was based on his car accident and I felt bad. I’d label this as a bit tasteless. :/ At least he wasn’t hurt. Well, the thing is that the car accident seems to have been a fake. Right now, they believe Woods purposely crashed his car due to some controversies. I think that it’s not so much as poking fun at a car accident, so much as it is poking fun at the whole Tiger Woods situation. Because obviously a Wii Wheel is required to play golf. Haha, nice comic. I don’t feel bad laughing at the issue because he wasn’t seriously hurt and the media just won’t let it go. As Jon Stewart said, it’s “the story of a man, famous for hitting a small ball with a stick, and his low speed, zero casualty, minimal injury car crash in front of his own house”. Who knew when I would see the day when 2P Start would do a golf related comic. As a golfer, it’s also one of the funniest things related to golf I’ve seen. Really like the little jokes at the bottom and the Wii Wheel icon. Ray actually referencing the real world? I HAVE INCREDULOUSNESS!!! Great comic as usual, I liked how you used golf terms to actually describe the crash. I can just picture them actually making this. This is a comic that even a non-gamer can enjoy. Really funny!! wait why is tiger saying YES if he crashed that made it more funny! 1) Real life events aren’t really payed attention to by most of the 2pstart community. It’s kind of that “Arg, this should stick to videogames” kind of thing. I think this kind of comic is refreshing, but I digress. 2) The text at the bottom is unnecessary, coming from those that don’t really get it. But by those that do, it’s loved. 4) Them be fightin’ words. 5) People don’t like the threaded comments. Also, hey look, new navigation buttons. Yeah, which is odd because they look less like the 2P START! style. They don’t fit the OLD style, this is new school 2P START! marketed more for 12-year-olds! Can’t say I really like the new ones, but that’s probably just because they’re new. I’m growing fond of them already. I especially like the two new buttons. Augh, the dreaded ‘downvote’ over at Joystiq. Maybe as the masses start to wake up across the country that’ll change by day’s end? The Nav buttons look great, Ray! I found this to be in bad taste and I am hereby boycotting your comic. Farewell. In all seriousness though, this was a great gag, and I like how his victory pose so easily transformed into one of pain with the addition of that image. 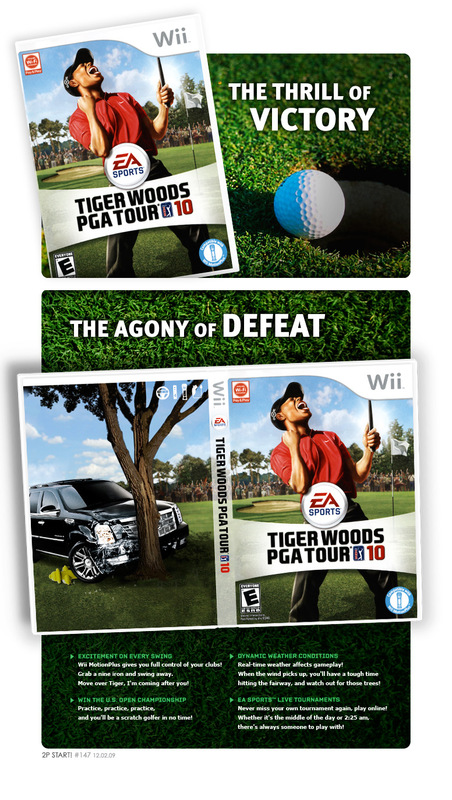 Also, I got sick and tired of watching my brother play Tiger Woods ’07 on his PS2 so that makes this even funnier.